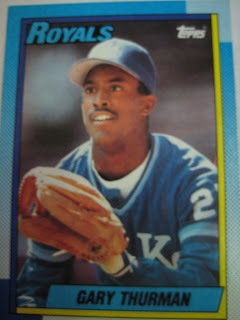 Not because Cardinal great Willie McGee is shown slumming in a Giants uniform. 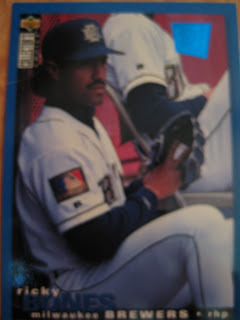 Or the ridiculous distorted picture on the left that mars the design of every 1994 Upper Deck card. No, it is the guy jumping onto the bench trying to get out of the way of a ball down the line. Not a dignified pose. There have certainly been some eyebrow-raising stadium billboards that have made their way onto baseball cards, especially at minor league parks. Like this ad for Rogaine. How many of you have had this card for twenty years and not noticed the Hooters ad in the background? You can see it on more recent cards as well. Considering the amount of Viagra commercials during ballgames, I wonder if they sponsor any billboards? That would certainly be a funny thing to see on a card. 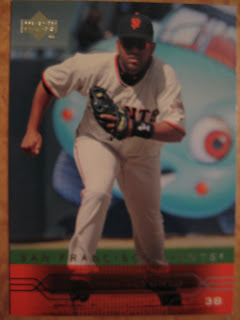 Unlike the blue cartoon car from Chevron, I know why Rafael Furcal is being chased by a giant floating panda head. He is in San Diego, and it is an ad for the San Diego zoo. Did you know that Exxon used to be called Esso, which used to be S.O., an abbreviation for Standard Oil? Now you do. 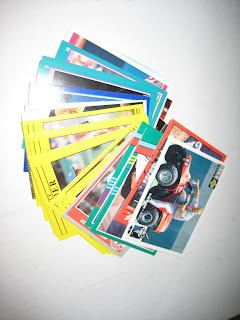 I usually use Sunoco because it's the cheapest, but couldn't find any cards with Sunoco ads. One gas station that is not in New York but you see all the time on baseball cards in California parks is 76. Kind of an odd name for a gas station, no? Run, Edgardo! Or the blue cartoon car is going to get you! Seriously, what is that? A character from a movie? An ad for something? And is that a big league stadium or a spring training park? Is the 1989 Topps Big Baseball card of Tyrone Vontrece Griffin the first American baseball card to feature former Cuban baseball star Fidel Castro? There sure have been some weird baseball card sets in the last few years. One of the weirdest is this monstrosity called Upper Deck Power Up, from 2004. I guess they were inspired by the bobblehead doll craze? I wonder if this set was the inspiration for the "little bit of luck" guy from the lotto commercial. The backs contained some random tidbits about the player. Great hobby, Carlos. Ten points! Miguel Cairo balances a ball on his chest. Sean Burroughs levitates his in mid-air. 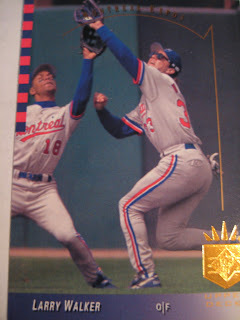 Paul O'Neill tries to steal Chuck Knoblauch's thunder on his 1999 Stadium Club card. Moises Alou does the same thing to Larry Walker on his 1993 SP. Here's the result of that collision. 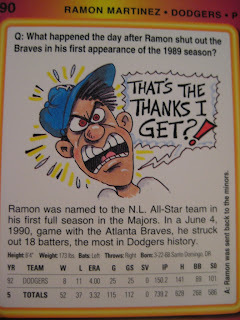 Here is a great card from 1991 Score. Ron Hassey and Danny Heep after a play at the plate, each looking up at the umpire waiting impatiently for the call. What's it going to be, safe or out? He is . . . OUT! Nailed trying to score from first on a Carlos Quintana double, as Felix Jose and Lance Blankenship successfully relayed the ball in to Hassey. Don't get too excited though, Oakland fans. 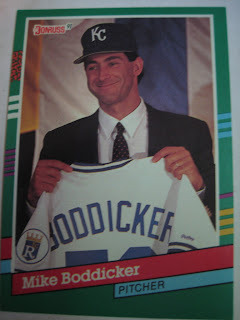 Boston won the game 5-1, behind seven strong innings from Mike Boddicker. And don't you gloat, either, Boston fans. You may have won the battle, but Oakland won the war, sweeping the Scarlet Hose in the ALCS. 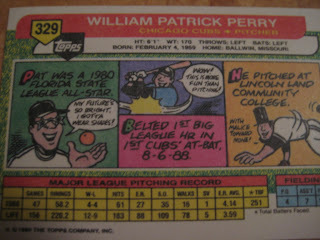 Despite what is implied in the picture, the Big Unit is only 6'10", not 9 feet as his 1993 SP card seems to indicate. Even better, he folds into a compact form a fraction of that size for easy storage and portability! That's the thanks I get? 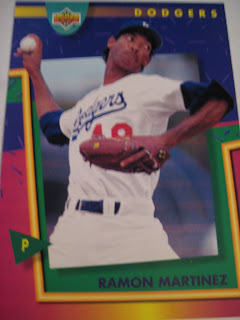 There's an interesting tidbit on the back of this Ramon Martinez card. What a great cartoon! But why would the Dodgers send down a pitcher after a shutout? I figured he probably got hurt and went to the minors for a rehab stint. I forgot that he was only a rookie at that point. The Dodgers were playing a doubleheader and just needed a pitcher for one game, and were going to send him back no matter what. His minor league manager, Kevin Kennedy, talks about that game here. To be fair, the Dodgers did have a good rotation, led by Orel Hershiser, Fernando Valuenzela and Tim Belcher. Tim Leary was coming off a career year, and Mike Morgan had a winning record. 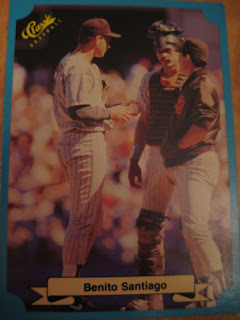 What a year 1989 was for inappropriate cards. Lost among the furor over Bill Ripken's bat handle and Luis Salazar's crotch grabbing, was this gem from Bowman. I guess "playing with your bat" is one way for a closer to pass the time until the ninth. 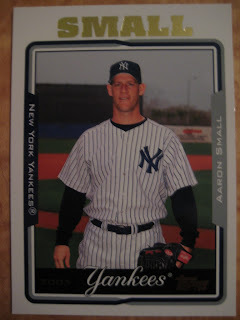 The only thing that would have been better is if it was a card of David Cone. 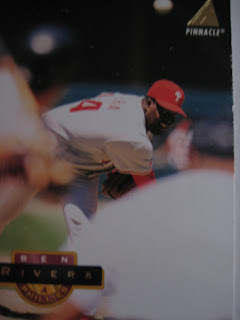 Which is worse, being hidden behind two teammates, like Benito Santiago? 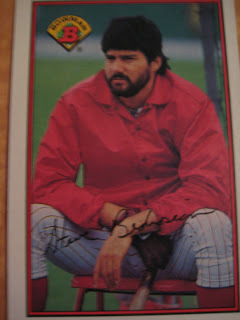 This picture would make more sense as an Eric Nolte or Larry Bowa (or is it the SD pitching coach?) card. Or peeking out from behind the massive bulk of the home plate umpire, whose blurry white form takes up most of the card? 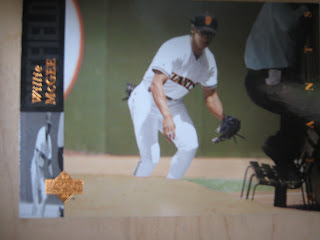 Either Shawn Estes used to throw righty and wear uniform number Z, or Classic flipped the negative on this card. Nothing says 1990 like blue on yellow tiger stripes. Not even the box in the corner that says '90. Kal Daniels's swing looks a lot more awkward when he's not wearing his sunglasses. I was curious about the radio station in the background. AM 880 in Southern Oregon is now a talk radio station. Instead of country music now they get Dr. Laura every night. Got some cool cards today in a trade with Bagwell Collector. There were a lot of fun cards like the Greg Olson on a tractor, Mike Easler's 1985 Fleer, and Scott Brosius's 1997 Pinnacle. 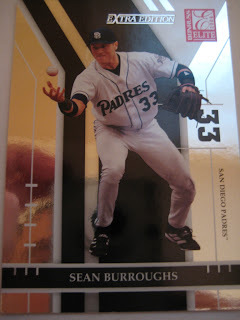 Here is another example of Donruss using the jersey for the team logo. 1990 Topps Gary Thurman - now the only ones I need for this set are Fred Manrique (242), Bobby Thigpen (255), and Sammy Sosa (692). Here are some more cool cards from Classic. Rick Sutcliffe in the 1987 All Star Game in Oakland - that must be Ozzie Smith behind him. Kal Daniels, in a rare shot of a player batting with sunglasses. I love cards with yellow borders like 1988 Classic and 1991 Fleer. Scott Ruffcorn at Baylor University in Texas. This must be right at the beginning of baseball season - you sometimes see trees on baseball cards, but rarely trees with no leaves. Here's Shawn Curran in his backyard. What's that flower next to him? I got this great replica Mike Schmidt rookie card from Andrew at the great Traded Sets blog. I really hope he doesn't retire and instead does the Upper Deck high number set he has been hinting at. Andrew actually sent three of this card, so I have two to trade if anyone is interested. 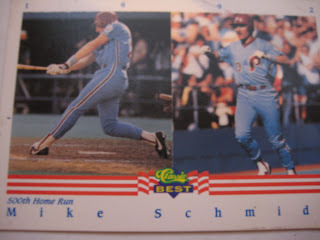 Speaking of Iron Mike, here's another card of Schmidt that I have had for a while that I think is pretty cool. 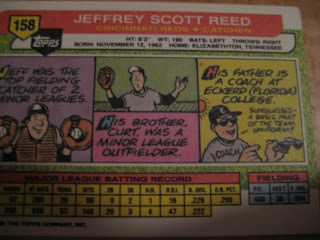 It is from the 1992 Classic Best minor league set - they stuck in a card featuring Schmidt's 500th home run. I always liked the Classic sets, both major and minor leagues. They always had nice clean designs and very good photography. This 1991 Upper Deck card of Mike Pagliarulo (my favorite player growing up) features a pretty rare occurrence that I don't remember seeing on any other cards - two runners going to the same base. It's the fourth inning of this wild game in San Diego, where the Cubs scored five runs in a game they eventually won 11-10. (Did the teams think they were in Wrigley?) With one out and Doug Dascenzo on first and Greg Maddux on third, Mark Grace hit a ground ball to first baseman Jack Clark. Maddux must have broken for home, because Clark threw to catcher Ronn Reynolds. Maddux sensed he was a dead duck and ran all the way back to third, giving Dascenzo enough time to make it there, and creating the scene Upper Deck captured here, with two Cubs heading toward third base. Pagliarulo was 0-4 in the game but walked and scored a run. I got a lot of Upper Deck cards in the big box of commons I bought recently. (By the way, a lot were dupes and are now on my up-to-date tradelist - link on the right side of the page if you are interested.) UD wasn't afraid to show the agony of defeat on some of their cards. Rob Deer won't catch up to this one. Tom Browning gets pulled by Cincinnati's manager. Louuuuuuuu! He was actually pitching a shutout at this point, but gave up a single and double to lead off the eighth - here's the boxscore. Randy Myers came in and shut down the Dodgers for a six out save. This year's baseball draft had the biggest star in college baseball this decade, Stephen Strasburg, get drafted by the worst team in baseball, the Nationals. Because of the way the draft works, the best players get picked by the worst teams. These teams are often bad in part because of their inability to develop their talent. As a result, these great talents are often wasted on teams that can't properly develop them. Imagine if David Clyde had been in the Reds or Dodgers organizations in the mid-1970s instead of a clueless Texas regime. Imagine if Toronto or Oakland had nurtured Ben McDonald instead of Baltimore. And of course, their are the freak occurrences, like Brien Taylor's shoulder injury that prevented him from ever pitching in Yankee Stadium. 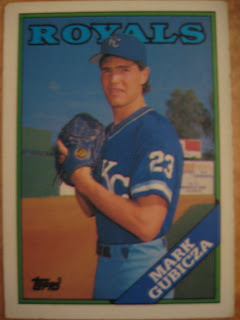 He was drafted the same year as Allen Watson, who pitched at Yankee Stadium while still at Christ the King High School in Queens, as captured on this cool 1992 Classic Draft card. Watson would later get to pitch there as a pro, as a member of the 1999 World Champs. At first this looks like a simple picture of Hal Morris, preparing to make a play at first base at some major league or spring training park. However, look closely. There is no foul line intersecting the base from either direction. Morris was never a middle infielder. And that base looks pretty small, about the same size as Morris's shoe. Definitely smaller than a regular base. Where is he? Maybe a spring training practice field? Or did he dress up in full uniform and get his picture taken in some elementary school playground? Sunglasses - a basic part of the team uniform! At least according to Jeff Reed's father. I have no idea what that is supposed to do with being a baseball coach. Maybe because Eckerd is in Florida? Pat Perry would have fit right in at Eckerd with those star-shaped glasses. Instead, he went to a college called Lincoln Land. This is probably the only baseball card to quote from Abraham Lincoln's second inaugural address. What is the best sitting photo of a Brewer in 1995 Collectors Choice SE? Dave Nilsson, lounging on a little stool. Ricky Bones, losing musical chairs. Greg Vaughn, sporting the towel mullet. Honorable mention: Brett Butler, demonstrating impressive flexibility, but not a Brewer. Baseball card or credit card?